The woes of the recession have turned into wows at this year’s Delhi Book Fair. Attendees are grabbing religious and spiritually-themed books off the shelves as if they were Kali, the multi-armed Hindu goddess of time and change, and redeemer of the universe, who has, apparently, redeemed an Indian book market hit hard by the global recession. Books on the philosophies and meditation techniques of spiritual gurus, general religion, self-help guides and Indian mythology are leading sales at the Delhi Book Fair, now in its fifteenth year. The boom in religious books trade at the fair, say publishers, reflects the larger trend in the market, which has seen a sharp rise in the demand for spiritual books over the last three years. "The demand for religious books is unbelievable. Everybody wants peace in life. There has been too much of crime and fiction. Over the last three years, we have seen a sharp rise in the demand for yoga, meditation, self-help and spiritual books. Even teenagers are buying spiritual books," Ajay Mago, publisher of Om Books, told Madhusree Chatterjee of the Indo-Asian News Service. Consequently, books on Swami Vivekananda, Osho, Baba Ramdev, Sri Sri Ravi Shankar, J. Krishnamurthi and a host of new age gurus - some written by the spiritualists themselves - are disappearing from the shelves by the dozens, along with the new reprints of the Bhagavad Gita, Ramcharitmanas, Vishnu lores, Buddhist texts, translations of Vedas, mythology and new tomes on palmistry and yoga. The buyers are mostly high school and college students, young professionals and homemakers - in the age-group of 17 to 35. The annual fair attracts national and international publishers, librarians, researchers, academicians, writers, students and book lovers from all walks of life. 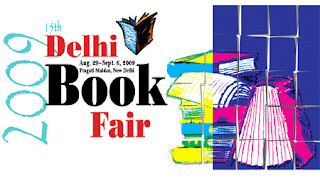 Delhi Book FairAugust 29-September 6, 2009.